Another year is coming to a close. Every year I am floored at how fast time is passing by. Just when I think things are going to slow down, it's as if the clocks are on overdrive and another few weeks have passed in a blink of an eye. You know time is flying when your kids make mention of it. My 9-year old son has repeatedly said how fast time is flying. He's 9! If it's going fast for him, we obviously need to slow things down a bit. Which is why I'd like to spend some time looking back. 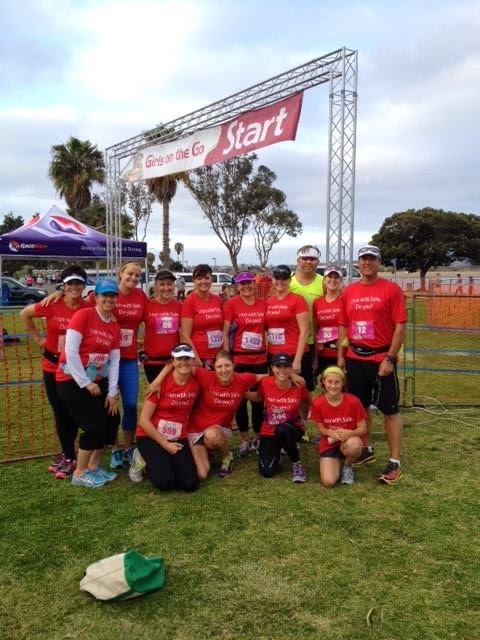 2014 has been a good year for Sole Health and Wellness and all of our Sole Mates! Our first program of the year began in January and trained for Finish Chelsea's Run 5K on March 1st. This evening program met entirely in the dark each week but they didn't let the cold and dark of winter stop them from reaching their goals. In fact, race morning was the first time we saw each other in the light of day! And this particular race day brought with it a huge rain storm, preventing one of our members from joining. But the clouds parted just in time for the race and it turned out to be a beautiful morning (that is, until it started raining just as the 5K ended). It was great to see the success and achievements of this special group. This was the first time we did a program for this race because when I learned about its story, it was too late to do a program for 2013. But I knew I wanted to support this race as soon as I heard about Chelsea King. If you don't know about Chelsea King, the local young woman for whom the race is named, be sure to read about her story and the reason behind Chelsea's Light Foundation. And local runners, send your friends and family to us to train for the 2015 Finish Chelsea's Run 5K. It's an amazing community event and one that we are very proud to be a part of. Take a look at all of our photos from the race. 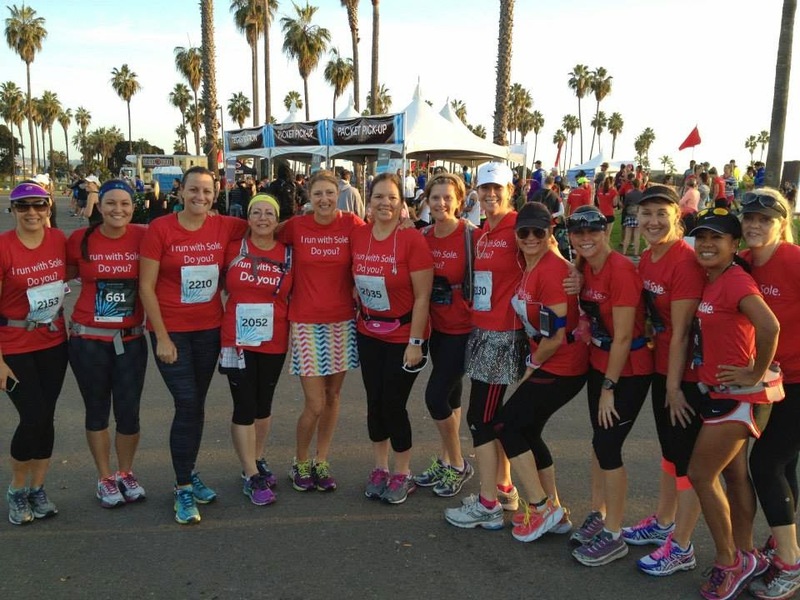 Post-race bliss for our CA 10/20 runners! February brought the inaugural running of the California 10/20 10-mile race. This program actually started in November of 2013, so their awesomeness actually spans between 2013 and 2014 ;) Honestly, this was a great race and a great group of people. These runners were mostly beginners and this was the first double-digit race for many of them, which was very exciting to be a part of. I actually ran this race with my group, which I rarely do since I want to be at the finish line to see everyone. Because this was the first time this race was put on, I needed to check it out to be sure it was one to come back to and train another group to run it again. So for me, this was a chance to be both coach and participant and enjoy the best of both worlds. 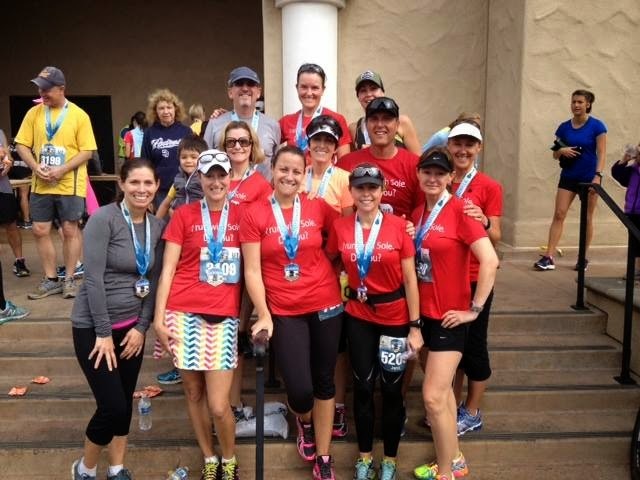 Race day was a little cloudy and rainy at the start but in true San Diego fashion, the clouds parted and sun shined on us as we ran through Del Mar, Solana Beach and Encinitas. And we were lucky enough to make it into the Marathon Show podcast for the race. It was great finally meeting Joe after listening to him for so long. You can listen to the podcast here. Excuse my bumbling as I was a little star struck that I was talking to Joe. Such a great guy! We're at about 19:00 into the podcast. The race itself was very well done, which isn't usually the case for a first-time race. But these organizers had their game faces on and we all had a blast. Can't wait for our current 10/20 runners to toe the line this coming February. Take a look at all our photos from the race. Pre-race love fest with the crew! The weekend after the CA 10/20 began our 10K and Half Marathon group. A few weeks later, our 5K group began as well. 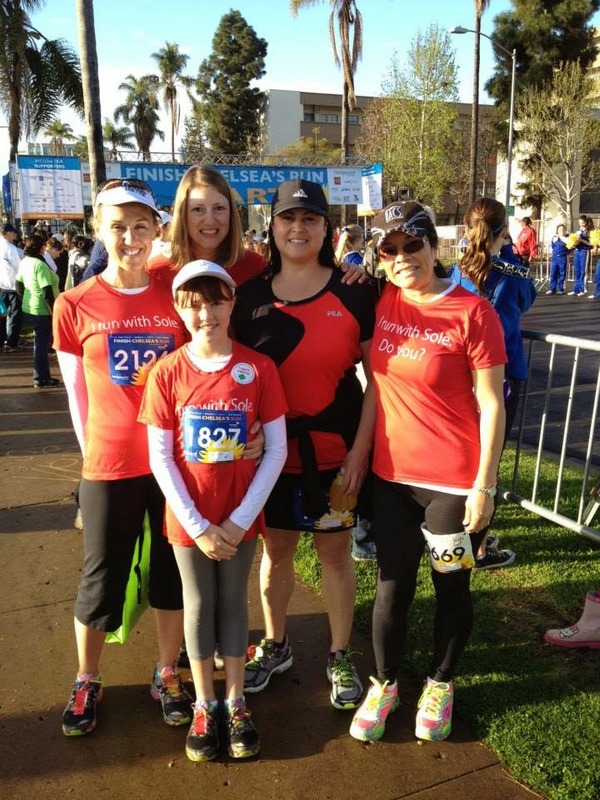 All three groups were training for the Girls on the Go 5K, 10K and Half Marathon in May. This was the second year we did a program for this race since 2013's event was a lot of fun. And the 2014 race did not disappoint. All of our runners did a fabulous job and for many of them, their respective race was their first time doing that distance. This race takes place in Mission Bay, which is always a great place for a race. The course is flat and you have several opportunities to see your runners as they make their way through the course. We had such a great group this go around and it was a great time for me to see them all reach their respective goals. It's always bittersweet when my Spring programs end. I take the summers off to be with my family, which is amazing. But I end up really missing all these crazy people I've become really close to. But it definitely gives us all something to look forward to when that Fall program begins! Take a look at all our photos from the Girls on the Go race. It was always a celebration with this group! The Fall brought another program training for another first-time race: the Celebration 10K and Half Marathon. We began in August and over the course of our 12-weeks, we definitely had some highs and lows. The race date was changed to a month later. Then the race distance was changed (from an 8K to a 10K) but we all took it in stride (get it??). There were some injuries along the way and some excessively hot long runs, but everyone overcame their respective issues and rocked the house on race day. They truly celebrated all they worked for over the course of the 12 weeks and earned all the kudos, accolades and yahoos bestowed upon them. This program was also the first time we partnered with our friend and Sole Mate Chris Vettel over at Perfect Balance Therapeutic Massage in San Marcos. Registration for the program included a 50-minute massage as well as a discount on a second massage, in addition to other goodies they received from us along the way. Working with Chris was a blast and I know this was only the first of what will be many partnerships with her in the future. Take a look at all the photos from the Celebration Run 10K and Half Marathon. Loved running with these ladies! Our last 5K program of 2014 was also a first for us! 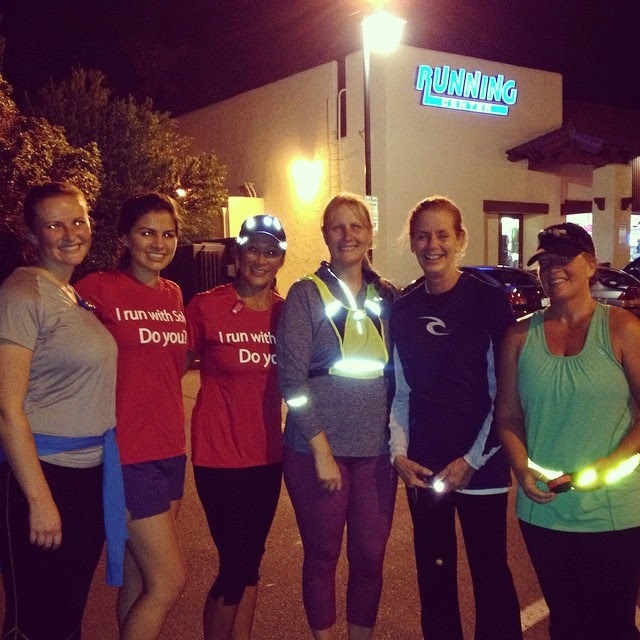 This was the first program in which we partnered with local running store Running Center in Carlsbad. I first went to the Running Center back in June of 2011 when my husband and I were here house hunting before our actual move across the country. I fell in love with the local store, known for their amazing shoe-fit process, work with the community and overall expertise in all things running. It reminded me so much of the early days of Fleet Feet Sports, Gaithersburg, where I worked for several years in several capacities, right up until the move here to San Diego. Anyway, working together, the Running Center and I hosted a 5K program training for the Oceanside Turkey Trot 5K on Thanksgiving Day. This program was so much fun and every week was such an adventure. While the 5K distance wasn't a new one for most of the runners, they were all coming back to running either after a break or really wanted to learn the "right way" to run, so they could run forever. Watching their transformation over the course of the 8 weeks was truly inspiring. I can't wait to partner with the Running Center again in 2015 as we team up to offer another 5K program training for the Finish Chelsea's Run 5K. Be sure to join us! And let's not forget all of our wonderful private running and nutrition clients we've had the pleasure to work with throughout 2014. There were pounds lost, age groups won, new race distances conquered, new countries and continents run and a couple of Boston Qualifiers. It was wonderful learning everyone's stories and being a part of their goals. It's always an honor for me to come along with my runners as they work towards something great, whether it's their first race or 500th, their longest distance ever or their fastest. I absolutely cannot wait to see what's in store for all of them in 2015. As for Sole Health and Wellness? Be on the lookout for exciting new training programs, personal training packages and some strength training classes in 2015. We'll help you run your best and strongest this year and in the years to come! As you look back on 2014, remember the highs, respect the lows and learn from them. Not every year is great for everyone but know that downhills lead back uphill and eventually those hills even out. I wish all of you a very happy and healthy New Year. You have all made 2014 especially amazing for me and I am looking forward to working and running with you in 2015! A new 5K program in the New Year!